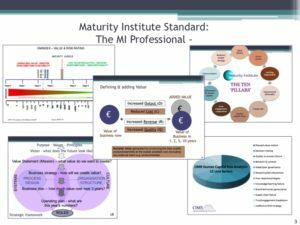 London, 24 February 2017: The Maturity Institute (MI), in conjunction with OMS LLP, releases today its OMINDEX (Organizational Maturity Ratings OM30+© template under a Shared IP Protocol. Paul Kearns, MI Chair said: “We have made an important decision to share our OM30+ methodology (that produces Organisational Maturity Ratings for the OMS LLP OMINDEX). This is a crucial route to develop both greater understanding and the professional practice of organisational maturity and human governance, which will directly improve Total Stakeholder Value (TSV) as a result. The Maturity Institute (MI) comprises a global network of professionally accredited leaders, practitioners and academics creating value for all stakeholders through organizational maturity that realises the full value of human potential for the benefit of society. Management quality and capability has been missing from conventional company management, valuation and investment decision making. Company failures and material value loss occur on a regular basis yet approaches to identify root causes use ineffective and weak diagnostics. Traditional analysis may identify certain corporate exemplars but not why they are able to generate long-term value differentiation. OMS fills that gap. OMS LLP researches, rates and advises on effective Organizational Maturity and Human Governance; a brand new discipline that finally makes whole, the way we examine, value and engage with companies to generate true, lasting value for all stakeholders.